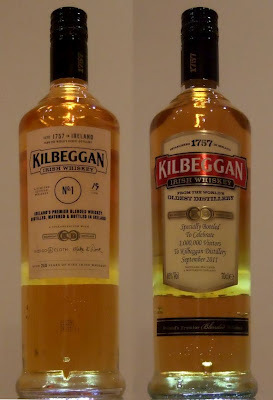 If you were tasked with taking an unbranded bottle of Kilbeggan Irish whiskey and whipping up a label for it, where would you begin? I might take a cue from the unusual art deco styling of the bottle and mash it up with those cool Age of Speed train and ship posters from the 1930s. The result would look like a prop from Poirot and quite unlike any old whiskey bottle I've ever seen but I'd claim it was a tribute to the great copper pot stills of a distillery just like those old travel ads celebrated the raw power of steam boilers. The whiskey-spotters will want to know up-front that there were exactly 100 of these numbered bottles produced. And see that "No. 1" front and centre? That's a hopeful nod towards possible future bottlings. In comparison with the standard label, the colour and the shiny have been binned, and the trademark elements stripped of ornament. I'm told the typography harks back to old Irish whiskey labels, though I don't know what the particular references were (any ideas?). For me, the closer you can get to the utilitarian, unshowy label on, say, a warehouse shelf, the better. It seems to say "this whiskey can speak for itself" or "there will only ever be 200 bottles of this; not worth waking up the marketing department for". Here are a few Japanese examples I like. Garrett's career has intersected with both Irish Distillers and Diageo but it was a personal connection to the Teeling family, owners of Cooley Distillery until last month, that led to this collaboration. It remains to be seen where the new owner, Beam, stands on such experiments. I am struggling to think of another company with the business model of Indigo & Cloth. It is both a creative consultancy with particular values, and a fashion store that embodies those values. I know startups that bootstrap their business by taking on consulting work and then ease out of it as product revenue grows. But for Garrett the dual nature of the business is the point. It is symbiotic, and it's not going to change. It may surprise those who have met me (not!) that I don't spend much time in clothes shops. But I can readily appreciate Indigo & Cloth's approach. Their racks are painstakingly curated, stocked during frequent trips to Europe. Sometimes the labels will be buzzing somewhere abroad but haven't reached this country yet (Brown Thomas can't stock everything), sometimes the clothing will come from an upcoming designer. There might only be six pieces of any one item procured and when they are gone, they are gone. In a real sense, the shop I visited a couple of weeks ago is no more. Not only has it been restocked with new lines, the shop itself has been revamped through the magic of carpentry. Regular reinvention preserves the excitement of the new and unexpected. If you start to think that this is taking dress very seriously, think "bottle of whiskey" instead of "article of clothing" and you'll be on familiar ground! Collaboration is the secret sauce behind Garret's various endeavours. In the shop, for example, he sourced tweed from a Donegal weaver, spec'd out a jacket, and found a tailor (in Kilkenny, if memory serves) to make them up. That kind of relationship with suppliers and makers extends to customers too, of course. The manufacturing process can be tweaked individually for a more bespoke result. The Kilbeggan whiskey was a collaboration too. It wasn't a commercial venture on either side, just "let's try something together and we'll see where it leads". Garrett and I crossed South William Street to Clement & Pekoe, a tea shop and café. I got a strong sense of the community of business owners and talented individuals working in that part of town. They all seem to know and support each other. Indeed, they are working together to improve and confer an identity upon South William Street and thereabouts. More opportunities for collaboration, this time thanks to proximity. Clement & Pekoe, by the way, is my new favourite spot for a cuppa. You can select from a huge range of loose teas and the coffee is up to scratch too, I hear. The Bretzel Bakery supplies the muffins. We never really developed an appreciation for craft in Ireland. We had plenty of it but let it go without much in the way of regret. The famed Hands series on RTÉ is at least 30 years old and it recorded what were pretty much the last practitioners of their various traditional crafts. It was living in countries with a deep-rooted pride in their own traditions, like Japan and Sweden, that propelled me into finding something - anything - that represented continued Irish skill and excellence today. I latched onto whiskey. It provides, I believe, an existence proof that we can still produce something great and distinctive in Ireland. We need to recognise such examples and apply their model to everything we do. The whiskey drinker's appreciation for craft and heritage is shared by Indigo & Cloth. Have a look at this beautiful video on the weaving of the Donegal tweed I mentioned earlier. That video, in fact, is how I first chanced across Indigo & Cloth. When I saw the name crop up again in connection with whiskey I spotted the craft subtext immediately. Indigo & Cloth aims to know not just the designers of its products but the makers too. That's a lot more convenient if it's made in Europe or the UK, rather than Asia. If it can be sourced in Ireland, even better. We still make knitwear in this country, for example, so if the design and quality is there, perhaps we don't have to look further. Connecting up a tight feedback loop between customer, retailer, designer and manufacturer can only lead to more innovative and rewarding products. And, of course, there is the economic benefit of keeping money sloshing around in the same community. Lifts all boats, etc. I've always thought that was a good reason for choosing Irish whiskey over, say, an imported vodka or beer. It's becoming a choice much easier to make these days with all the great craft beers and Irish whiskeys coming to market. Same for our wonderful edible produce. When clothing outlets are quoting mathematicians, it's clearly time for me to get back in the style game! I mentioned earlier that Indigo & Cloth is both a shop and a creative agency. I don't feel I've done this unusual company justice at all in capturing its values and ideas but if I was in business and looking for a collaborator to explore and stake out new and original territory, these are the guys I'd talk to first.